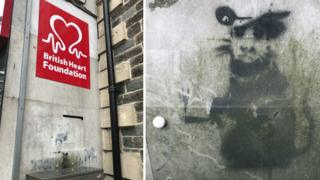 Home Latest News Did Banksy paint rat on charity shop wall? Llanelli mayor David Darkin has sent images to the art dealer who bought Banksy’s design Season’s Greetings, painted on a garage in Port Talbot. “It’s better to have it protected in case it is a Banksy,” said the mayor. The graffiti on a charity shop wall is said to have been painted a decade ago. Essex-based gallery owner John Brandler, who paid a six-figure sum for the artwork in Port Talbot, said the Llanelli rat could be authentic and he planned to visit soon to judge for himself. He based his opinion on the photographs he had seen, and the claim that the graffiti was said to be at least a decade old, which is when “Banksy rats” appeared in industrial towns. “I’m happy to go with 50-50 for now that it’s a Banksy,” Mr Brandler said. Llanelli artist and photographer Roz Moreton, 53, is more convinced. She said she recognised the work when she moved back to the area a decade ago. “I studied in Bristol and lived in London and I’ve been exposed to a lot of Banksy including his rats on Westminster Bridge,” she said. 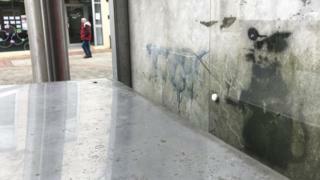 Ms Moreton said she revealed her suspicions to the town council after hearing reports that vandals had tried to steal pieces from the Banksy in Port Talbot. About 20,000 people are thought to have visited that artwork over Christmas. Community leaders in Llanelli are hopeful their rat could also prove popular.